There he sits in the corner chair in my bedroom, his unseeing eyes fixed in place, his red horns never moving. If you entered our master bedroom, you might wonder why a Christmas reindeer holds court, an apparently out-of-place decoration on this early October morning. He is there out of courtesy to my six-year-old daughter. You see, some months ago she thought it was important that my husband and I have a stuffed animal to keep us company through the night. It only makes sense in her mind, the child who would sleep with an army of them if I didn’t relegate her to two, that we should have one for our bed, also. At first, the animals who were given to us each night rotated – an elephant one night, a teddy bear the next. Then somehow we ended up with reindeer. 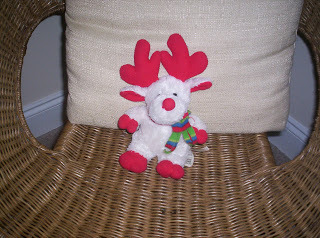 Now he doesn’t return “home” to my daughter’s room each night, but remains in our chair all day. So as I make the bed today, I glance over and see him there. She is at school, in the midst of reading words and reciting math facts. I am home alone, yet I feel her love, her spirit, her imagination. This small piece of stuffed fabric symbolizes much more than it knows. He is part of the family, a tradition that will linger when his owner has moved beyond stuffed animals, when she no longer holds one in her grasp as she drifts off to sleep. I hope she doesn’t reclaim him too soon. Our chair will look mighty empty without him. This post is linked to Your Life, Your Blog, Beautiful Life Friday, Finer Things Friday and Show & Tell Friday. Love your sweet reindeer for Show & Tell!Your posts are always warm and heartfelt! I hope you will stop by soon and visit me! Sweet post- Love your attitude. Awwwww – that is SO sweet! By the way, I am having my first giveaway on my blog if you're interested! That is so precious! How sweet of your daughter to "let you" keep him so he can watch over you while you sleep. I have two daughters (who are adults now) that used to sleep with many stuffed animals every night too! When we traveled, they were only allowed to take two with them (and their blankets). Thank you so much for sharing such a sweet story, and reindeer. Have a lovely weekend! Oh that is so touching!!! That is one of the great things about blogging..now this is documented so when she's 20 years old she can read this and remember the reindeer! I wish blogging was around when my kids were little! Thanks so much for joining in on my first time hosting Show and Tell! Such a sweet story. They do grow up so soon. Enjoy the reindeer & that sweet little angel that shared her treasure with you. I love it! My mom and daughters made me a build-a-bear for my birthday last year and it too sits by my bed… on my nightstand. It's a wonderful reminder of them each and everyday!